Even as Hellman has disappeared into history, Wakeman remains alive to specialists through the famous auction of his library of American literature in New York at the American Art Association in 1924 (sans the manuscripts sold to Morgan). The auction catalogue and its contemporary reprint served as a basic bibliographical tool for decades and even now is an astonishing record of a dedicated collector’s achievement. “When Mr. Wakeman set out in the year 1900 to acquire a library which was to contain the works of certain American classic authors, he brought to the task a penchant for collecting, a taste for good reading, a fund of experience in business affairs and a naturally incisive mind. For twenty years he devoted himself to the study of his nine favorite writers of fiction and poetry, conducting all the while an active search for copies of first editions of their productions and especially for examples bearing a personal association with their creators through autograph signatures or through accompanying letters referring to the books. “Mr. Wakeman was fastidious in securing fine examples. 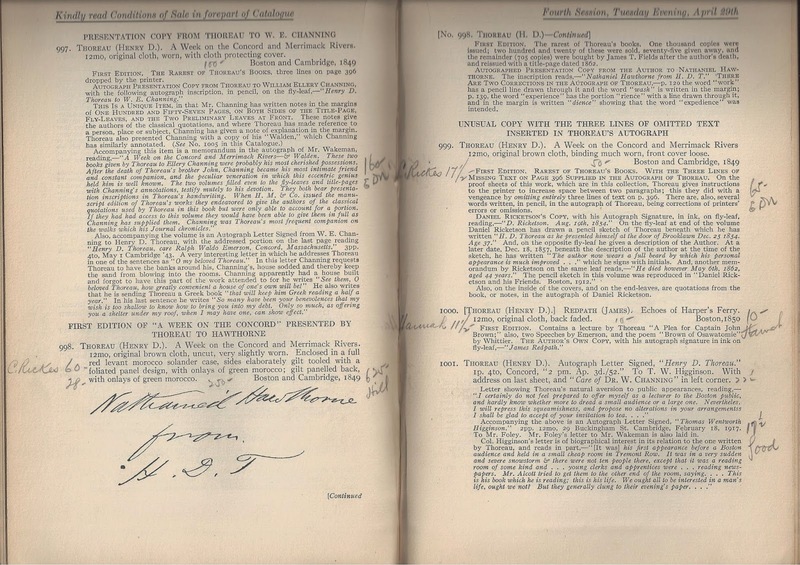 Many copies of many books received on approval were returned unbought because of slight imperfections. As a result of adherence to a standard of excellence, the collection is unique in the immaculate condition of the first editions comprising it. “That his relations with fellow collectors and with dealers were a source of keen interest and pleasure to him is evident when one peruses his copious and interesting correspondence with them. “Besides printed books, Mr. Wakeman acquired a remarkable collection of manuscripts of great American authors and poets of the Nineteenth Century, including among their number all of Thoreau’s journals and important Hawthorne and Longfellow items. Most of them were purchased from him by the late Mr. J. P. Morgan in 1916, but some precious manuscripts remain in the Wakeman Collection. “It was his custom to insert in each of the important volumes of this library a slip of paper bearing in his penciled handwriting a description of the book calling attention to features of especial interest. These notes form an interesting contribution to American bibliography. A number of years ago, I was fortunate to acquire what I consider THE copy of the auction catalogue. Arthur Swann’s annotated copy with ownership signature. Swann was director of the American Art Association book department at the time, oversaw the sale, and catalogued the material with the assistance of his staff. Prices and buyers are recorded. Correction slips for three lots are tipped in. Perhaps uniquely, Swann has also recorded absentee bidders and the price Wakeman paid for each lot. This latter set of annotations is particularly fascinating, and reflects the frequent wide divergence between the auction prices and Wakeman’s costs, sometimes to his favor and sometimes not. For example, he did very well overall on his Poe and Thoreau, but took a beating on many of the Whittier items. In addition to the Thoreau manuscripts acquired from Hellman and sold to Morgan, Wakeman had 103 jaw-dropping lots of Thoreau material in the auction sale. These included letters, additional manuscripts, inscribed books, and books from Thoreau’s library. 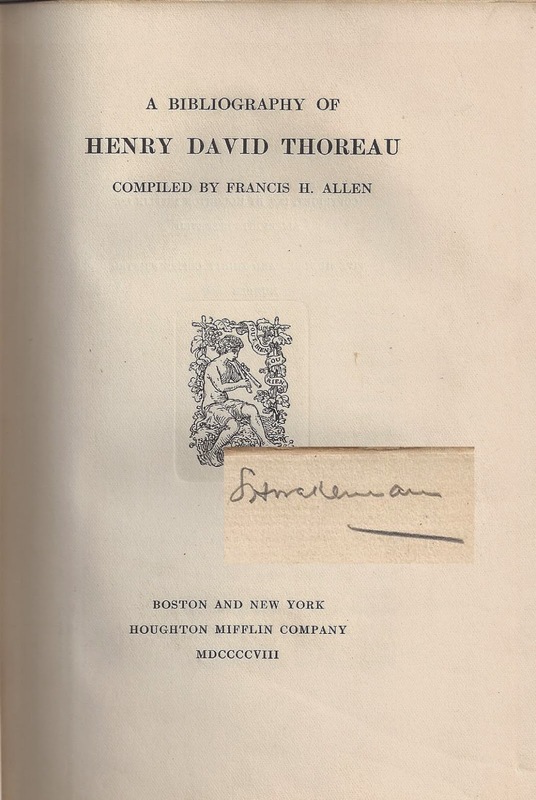 So, you can see why I was quite excited to acquire the following for my Wakeman holdings: his own copy of Francis H. Allen’s A Bibliography of Henry David Thoreau (1908). It has Wakeman’s booklabel, ownership signature, and a letter from Allen to Wakeman, thanking him for his “pleasant note” about the book, and “glad you’ve got that set of proof-sheets.” Wakeman is acknowledged formally for his help in the preface and mentioned in reference to a number of books in the text. 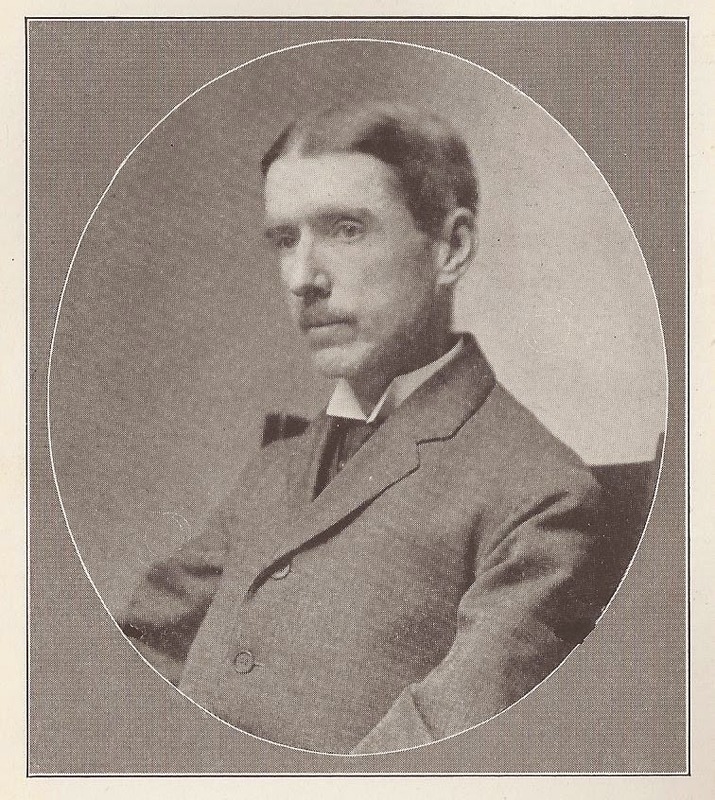 Wakeman’s efforts were the culmination, both in material and technique, of the first wave of American literature collectors. Most notable among these were Charles B. Foote, Owen Aldis, William Harris Arnold, Marshall Lefferts, Frank Maier, and Jacob C. Chamberlain. 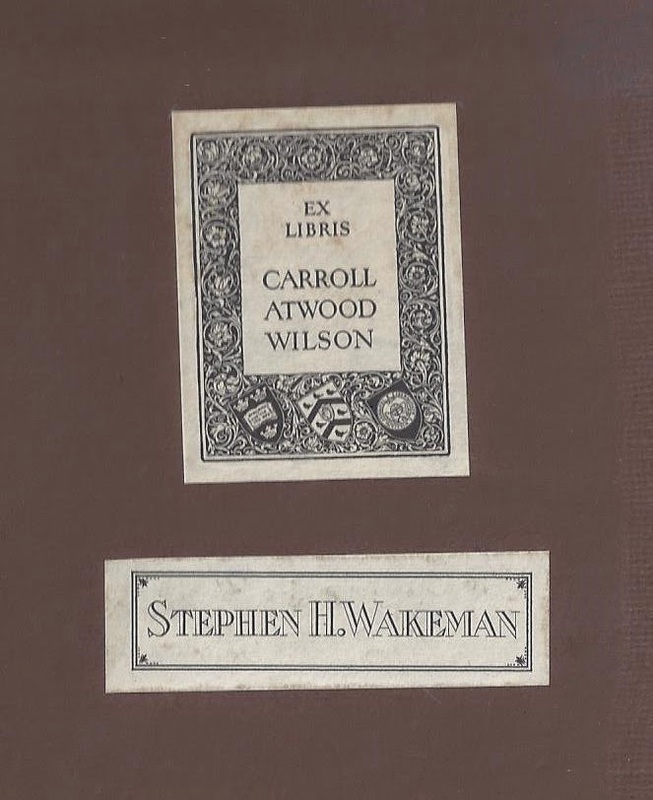 Wakeman’s pursuit of association material, manuscripts, and letters, his insistence on fine, original condition, and his in-depth gathering of ephemeral items, set the standard for the great collectors to follow, particularly Carroll A. Wilson, Parkman Dexter Howe and Clifton Waller Barrett. The reference to Carroll Wilson and Wakeman’s influence upon him has a particular poignancy for me. I bought in 2008 a copy of Ralph Waldo Emerson’s Letters and Social Aims (1876) – another favorite author of the two collectors—that bears both men’s bookplates. The Wakeman-Wilson copy of Emerson's Letters and Social Aims. Let us finish as promised with George Hellman’s account of the sale of the Wakeman manuscripts to J. Pierpont Morgan. Reading Hellman’s book inspired this essay and he should not be forgotten. As you will see, he was among many things a heck of a salesman, both with buyer and seller. “I’ve often thought of that,” he answered. “But Wakeman could not so quickly come to the decision to part with his treasures, and I left him with the suggestion that he should think the matter over. When next we met, some weeks later, the subject was again broached, and this time Mr. Wakeman said that though he would not commit himself, and would in any case wish to keep his first editions and association books, I might make a study of his manuscripts and suggest what price Mr. Morgan would, in my opinion, be willing to pay for them. So the next day I went carefully over two or three hundred manuscripts, including such star pieces as Hawthorne’s Blithedale Romance, Poe’s Tamerlane, and various the great essays of Emerson. At the conclusion of the analysis I named a sum in the six figures as my estimate of the value of the collection. “This last remark was made because I had suggested that another collector, W. K. Bixby, of St. Louis, might be willing to pay more than the sum I had suggested in connection with Mr. Morgan. “The manuscripts were accordingly sent to my office, there to be carefully catalogued. With these descriptions in detail, and with many of the more important items forwarded to his library, Mr. Morgan was able quickly to size up the remarkable character of the manuscripts offered. His interest was immediate, but though he did not question the price asked, it represented a sum larger than he had ever expended on a single purchase of manuscripts, and he asked me to return a few days later for his decision. At the second meeting Mr. Morgan was still undecided, and said that I should come back the next day. This was some time in the month of May. On arriving at the library for the third time I was aware of a rather unwonted atmosphere of activity. Several gentlemen, presumably business associates of Mr. Morgan, were in conference with him. “Very well,” I answered, and returned to my office. “But I have promised to reserve the manuscripts for Mr. Morgan until his return in July,” I replied. “The situation thus became rather a difficult one. The owner of the manuscripts was a reserved and wealthy gentleman who at my solicitation had made the concession of offering America’s greatest collector the opportunity of acquiring his cherished treasures. His request for their return, could, of course, not be disregarded; but on sending them back I took the liberty of retaining just one manuscript, a poem by Longfellow. This I placed in a large envelope, writing on the outside ‘Property of S. H. Wakeman’; and about the same time I informed Mr. Wakeman that I intended to resume the transaction with Mr. Morgan in July. “You’ve heard what I said,” he replied. “You’ve heard what I said,” I replied with a smile. “July came and the newspapers had recorded Mr. Morgan’s return. Shortly thereafter I went to his library. He was alone in his room at the western end of the building, a room which opened into a fireproof chamber that contained his manuscript treasures. He was seated before a table on which he had been playing solitaire, a recreation that one could not help recalling had been a favourite pastime of Napoleon. In earlier discussions I had laid stress on various points which made the Wakeman collection the greatest in existence of its kind—finest in the world as regards Hawthorne, Thoreau, Poe, and Whittier, and exceedingly important as to the other authors. The obvious arguments had been used without convincing success and on this occasion I had determined to try another approach: and if that failed, I did not intend to bother further. It was with this in mind that I had retained the one manuscript alluded to above. “No, Mr. Morgan. I’m afraid it’s no use my coming again. As a matter of fact I do not know whether today’s visit is of any use.’ And I then told him that Mr. Wakeman had withdrawn the collection, but that I still thought that if he, Mr. Morgan, would come to an immediate decision, I could see to it that the manuscripts would become part of his library. “Mr. Morgan, of course, knew of Mr. Wakeman as an ardent collector to whom the money value in the transaction we were discussing was a minor consideration. As a man devoted to his own treasures Mr. Morgan could readily understand the sentiments that had prompted Mr. Wakeman first to offer and then to withdraw the offer of his collection. Mr. Morgan sat there for a moment, obviously considering the entire situation. It was then that I took up the one manuscript that I had kept. “What’s that? said Mr. Morgan in his quick, incisive way. I fancy that he was not used to having his private sentiments brought into a business discussion. “When Mr. Morgan finished reading the poem he hit the table with his fist. ‘I’ll take the collection,’ he said. What rare items, worth thousands upon thousands of dollars, had not been able to consummate had now been effected by a short manuscript of comparatively insignificant monetary value. “’The Children’s Hour’ had made this enormous appeal to Mr. Morgan because he was himself a lover of children; and in that stately library to which influential and distinguished leaders in all fields came, somewhat as courtiers came of old to a powerful prince, Mr. Morgan’s grandchildren romped around with that freedom made possible by their grandfather’s affection for them. They were among the comparatively few people who held in no awe whatsoever the masterful man who delighted to play with them” (pp. 42-47). Biographical sketches of the many collectors mentioned in my essay can be found in Donald Dickinson’s Dictionary of American Book Collectors. Link to a scanned copy of Hellman’s Lanes of Memory.